The media took about a nanosecond to realize that both trainer Roger Attfield and jockey John Velazquez, who teamed up to win Monday’s feature race with Kissable, were about to enter the Hall of Fame on Friday. Attfield sent Kissable down from Woodbine for the 1 ½-mile, $100,000 Richmor Aviation Waya Stakes. He proved to be more than a man with a mission by hiring a rider who was rolling along at a 25% winning clip. 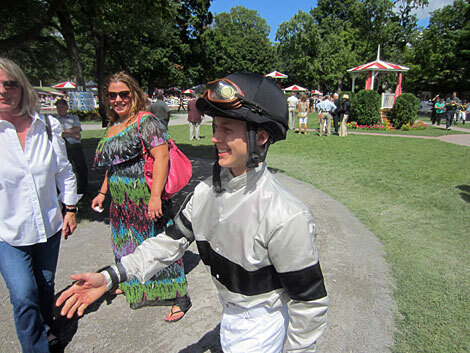 Eighteen-year-old Dylan Davis, the son of former New York circuit jockey Robbie Davis, took a bit longer than a nanosecond on Monday to ride in his first professional horse race. As a matter of fact, the recent Saratoga Springs High School graduate waited three races─two in which his mounts scratched and the other in which he didn’t have a mount─before getting the leg up on Black Rhino from trainer Wesley Ward. Dylan Davis being congratulated for first ride prior to finishing fourth. Hope, the virtue on which horse racing is based, laced the walking ring as Davis entered it. But the boy rode like a man in need of a race. Black Rhino finished fourth. By the way, how good was it of Ward to entrust Davis with a horse with a 5-2 chance? Time passed quickly for most fans as the Saratoga card unfolded with even more excitement following that. Over the Counter nipped Laguna Girl by a nose and Laguna Girl nipped My Kinda Party by 1 1/4 lengths in the fifth. In the sixth, four horses ran four across for the last 200 yards until two horses separated themselves by a neck from the two others. Just for Today, ridden by Joel Rosario, took a pose for the winner’s circle photo. In the seventh race, Lucci the Lion held off Maintainer in a nail-biter. Maintainer is by a sire─Wildcat Heir─that wins at a rate of 21% with 2-year-old first-time starters. The first evening of the two-night Fasig-Tipton Selected Yearling sale drew gasps, but not as many as the auctioneers expected. More cocktails than yearlings were sold. Revenues were off about 20%. President and CEO of Fasig-Tipton Boyd Browning said sales would go better on the second night. They bounced back so high that the two sessions combined became nearly a match for last summer’s auction. 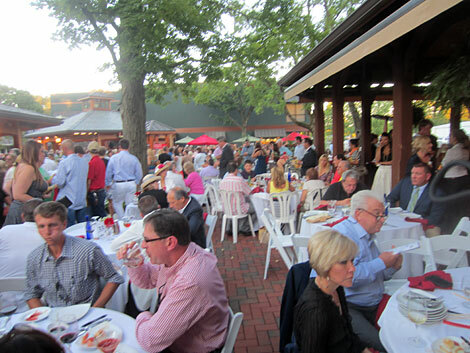 The sales for many people are another occasion to party in Saratoga. 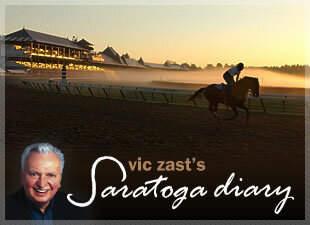 The Tuesday morning Saratogian reported that the racetrack is down in attendance. A few promotions planned for the week ought to remedy that, but don’t count on it. The citadel of New York horse racing needs an overhaul, a shorter season and trustworthy management. Mariano Rivera, the New York Yankee relief pitcher, is visiting on Friday. Some sort of picnic mat will serve as a giveaway on Sunday. The pink and white striped party tent went up next to the swimming pool in Peggy Steinman’s backyard. “Ted” continues its run at the Malta Drive-In.